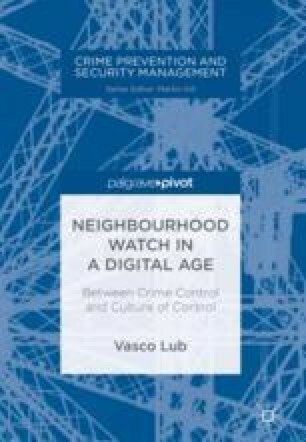 This chapter presents an ethnographic study of the neighbourhood watch team Burgerblauw in the district of Tarwewijk in Rotterdam, the Netherlands. The Tarwewijk is a relatively poor district where dilapidation, petty crime, drug trafficking and a neglected public space constitute acute problems. The watch team seems to thrive under a certainly indistinctive image. Precisely because Burgerblauw is not always taken seriously by certain civil bodies and operates in relative calm and clandestinity, the team is able to gather information that contributes effectively to combating crime and disorder. In Burgerblauw, residents find a safe buffer to communicate reports and tips about crime or disturbances. The ostensibly contradictory combination of keeping a low profile and perseverance makes the Burgerblauw team into a subtle but influential local factor.